The Hobbit - Presented by Tribute > Video > The Hobbit: Battle of the Five Armies Canadian premiere – exclusive! The Hobbit: Battle of the Five Armies Canadian premiere – exclusive! The Hobbit: The Battle of the Five Armies had its Canadian premiere in Toronto on Dec. 6 and Tribute was there to get you all the details on the last journey to Middle-earth. We spoke to Peter Jackson, Lee Pace and screenwriter Philippa Boyens on the red carpet about the best moments on set and some of the unforgettable characters from The Hobbit trilogy. 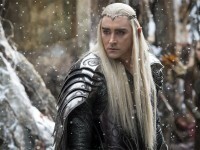 The Hobbit: The Battle of the Five Armies will be out in theaters Dec. 17, 2015.